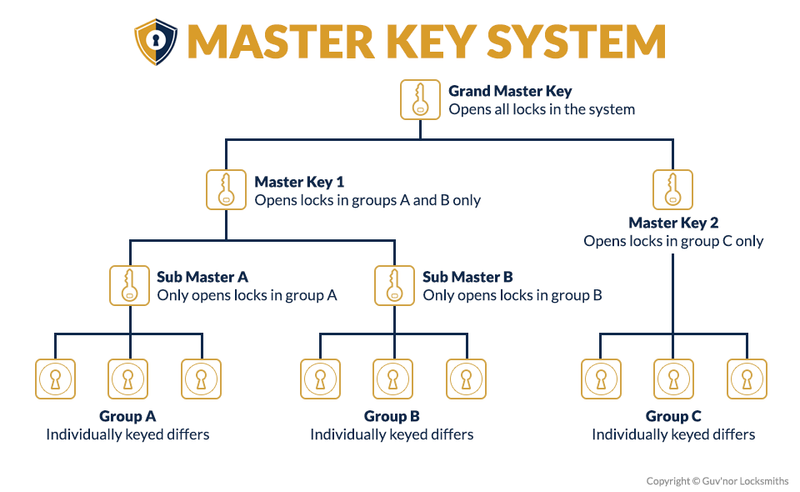 The master key system is hierarchal and comprises a number of different keys and cylinders/locks that allow different groups of key holders access to specific areas of a building/premises. 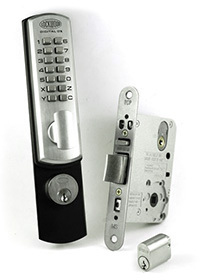 The master key will open any and all locks in the system and all other keys below the master key have restricted access to designated areas. The lowest level key holders may be restricted to opening only one lock if required whereas senior management may be able to open all locks with the exception of the Grand Master Lock which may only be unlocked with the Grand Master Key. Keys are patent protected and additional keys may only be purchased through Guv’nor Locksmiths and may only be ordered by the CEO or designated staff from within your organisation so you have the security and peace of mind knowing that additional keys are not freely available on the open market or from the nearest hardware shop. Key manufacturers are not allowed to produce copies of the design. We recommend maintaining a simple key register so that you are aware at all times who holds keys.